Melanie, please email lora at onecrazystamper dot com to claim your prize. * Other: I created a soft fuzzy pillow for the princess to rest on using Flower Soft Extra Fine Black. 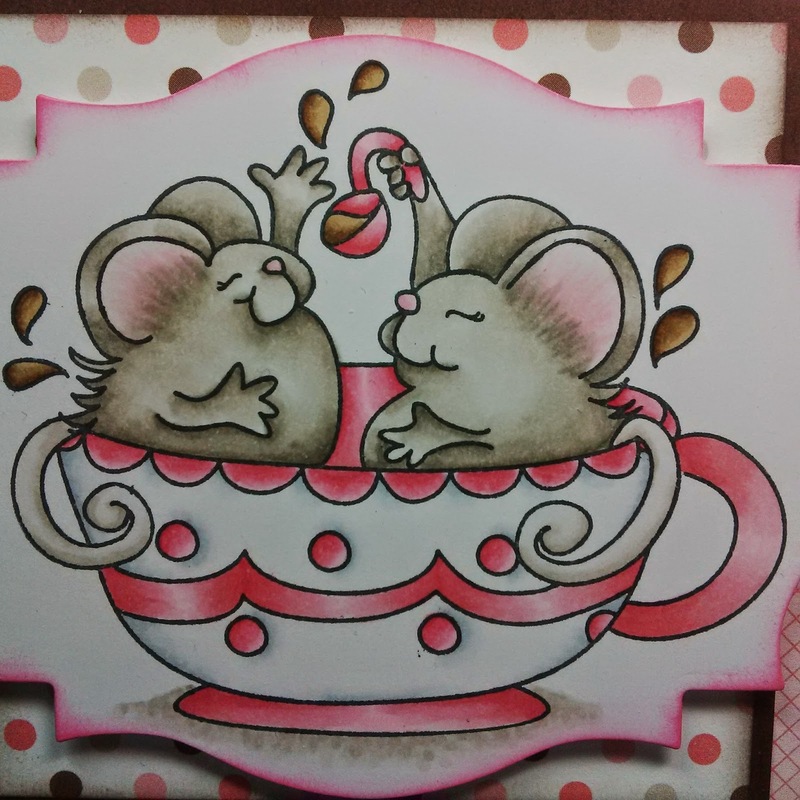 Labels: High Hopes Rubber Stamps, Shari G.
My card features another adorable High Hopes image called Favorite Honey Bear which I have stamped with Memento Rich Cocoa ink on Copic Xpress It cardstock, then colored with Copic Sketch markers. 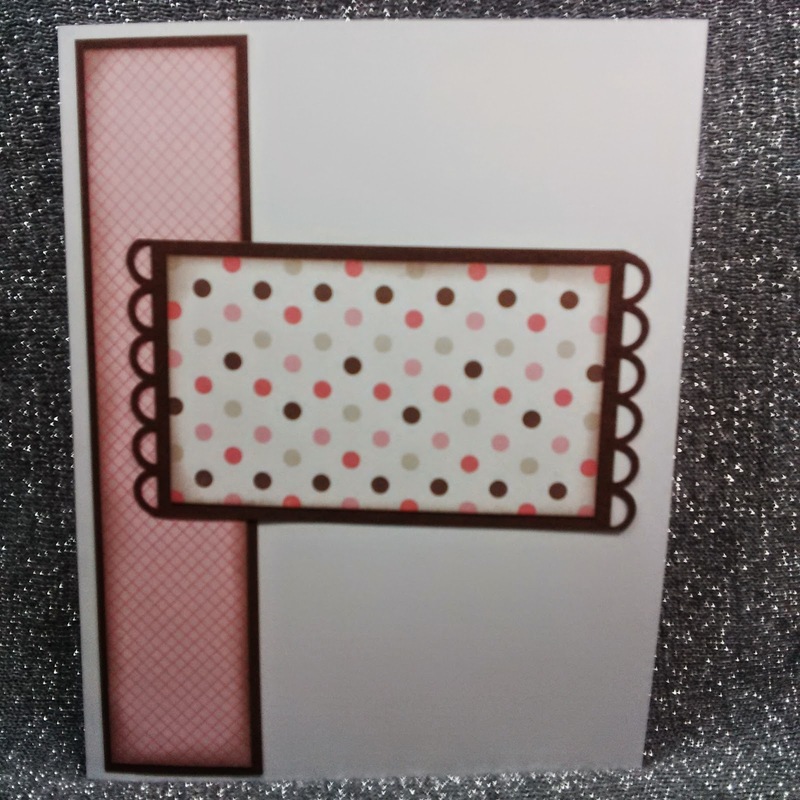 After fussy cutting the image I placed it on the card front that features Simple Stories dp, Prima flowers, pearls and a hand written sentiment. Wacky Wednesday is here again and there is definitely a chill in the air. It seems that a record will be set for this month as being the coldest February on record. 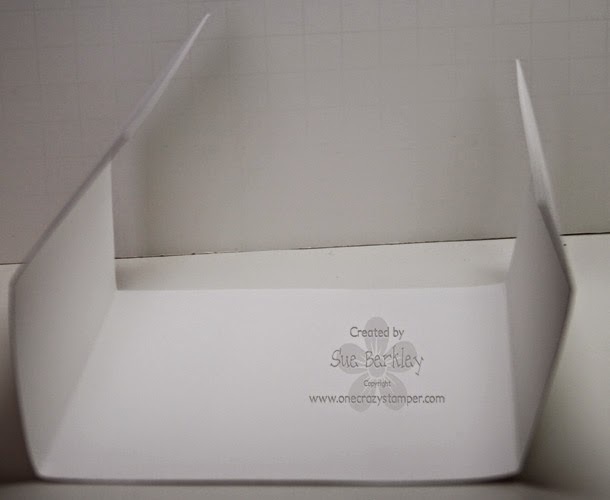 Instead of a card for my OCS post today, I have a tutorial for two different styles of card holders or as a possible recipe holder. 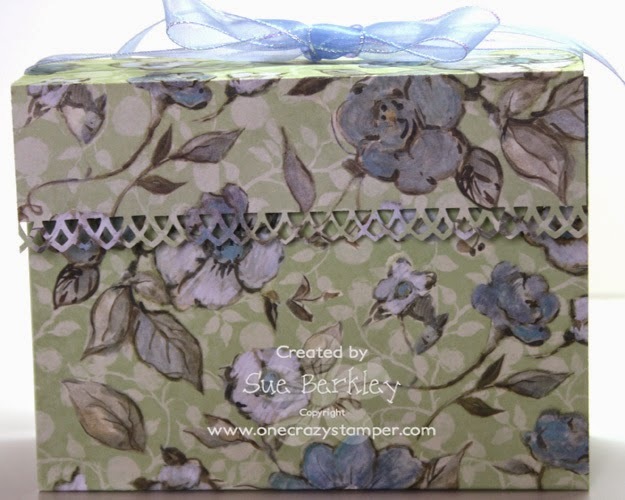 The first one is an Accordion Style Card Holder, that I saw on SplitcoastStampers originally done by Jane Matsumoto. The second one, is from InkStainswithRoni blog and is done in a completely different manner and is definitely more fiddley to do. 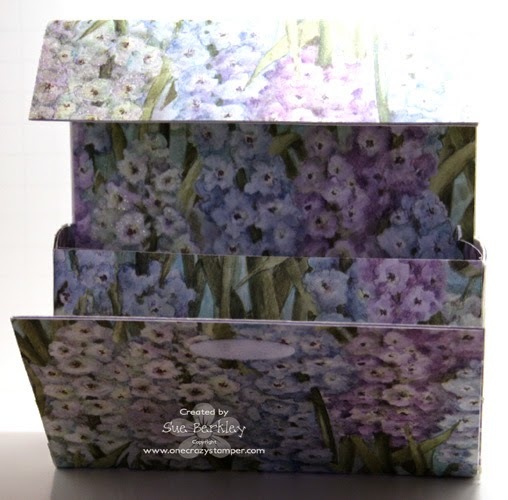 Both of these holders will hold 4 1/4" x 5 1/2" cards and or recipes. Either one can make a nice gift for someone special. So make yourself a cup of coffee or tea and take a few minutes and have a browse. I hope you find this useful. My next little project will be to create something that will hold cards between 5" x 5" to 6" x 6". 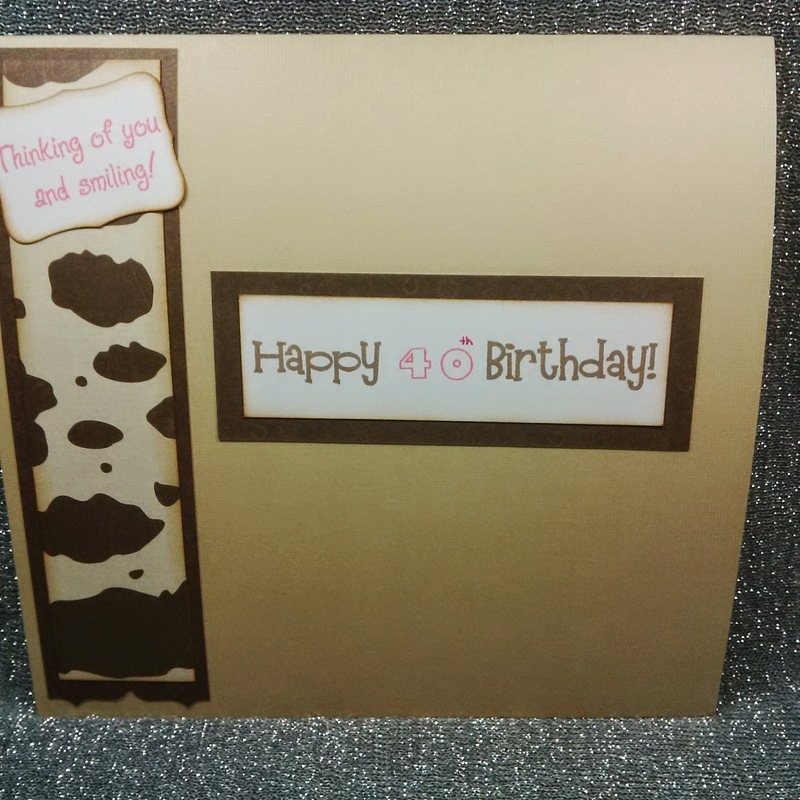 Supplies used -- this can be done with one sheet of 12" x 12" double side patterned cardstock as well as one sheet of 8 1/2" x 11" white cardstock. Score the 6" x 12" patterned paper at 4 1/2", 6 1/2" and 11". This will form the base. 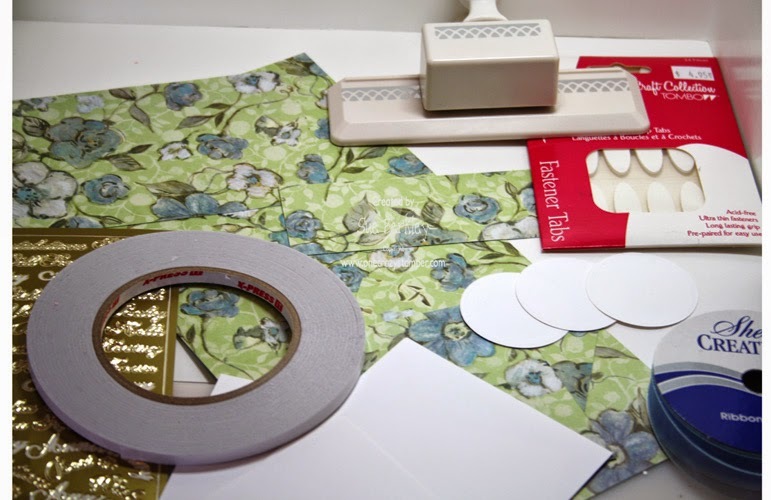 Score the 4" x 6" piece of patterned paper at the 2"mark and fold in half. 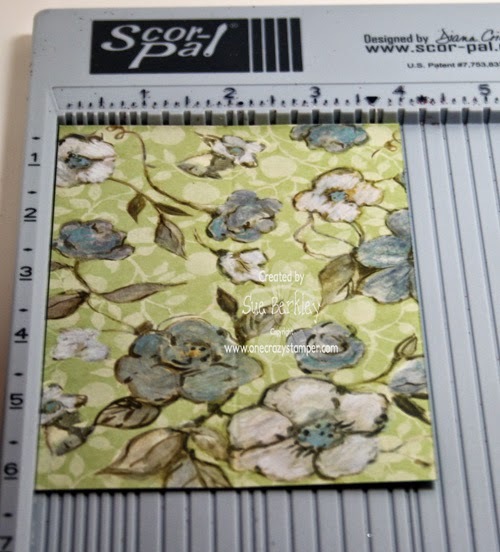 Use the decorative edge punch on one end and attach this piece along the scored 1" section of the base with Scor-Tape. 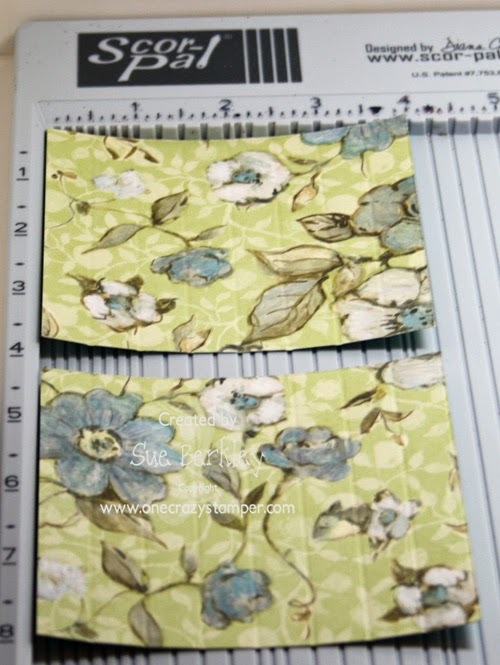 Score both pieces of the 3 3/4"x 4" patterned paper every 1/2" across the 4" side. Crease the scored lines well and attach the accordion pieces to the sides of the base. Take care to line up right along the edges of each panel. I forgot to take a photo showing where the ribbon should be added. Scor-Tape is added to the seam underneath the top flap (decorative edge) and attach the ends of the ribbons about 1 1/2' from each end. 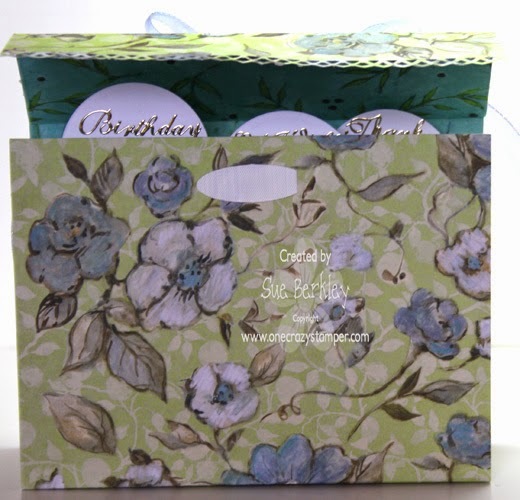 The 2" x 6" piece of patterned paper is adhered to cover the seam and the ends of the ribbons. I used some peel off stickers to add as labels to the circles and adhered the circles to the backs of the 3 7/8: x 5 1/2" cardstock pieces, which are then inserted into the accordion slots. I attached a Hook and Loop Fastener Tab (Tombow) to the front panel. 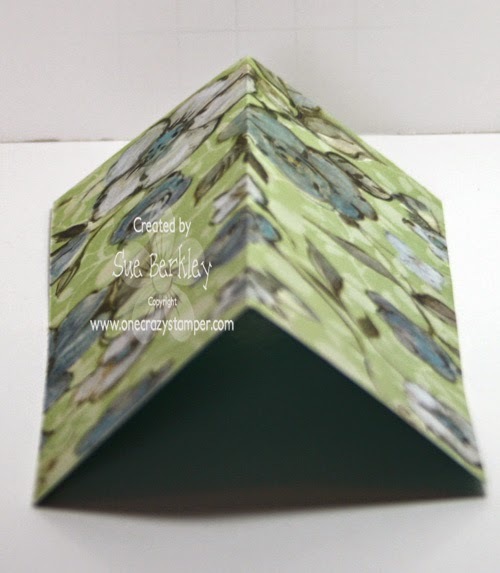 This card organizer was seen on InkStainsRoni's blog here and is much more fiddley to make. The basic organizer users 2 pieces of 12" x 12" heavy cardstock plus design paper. 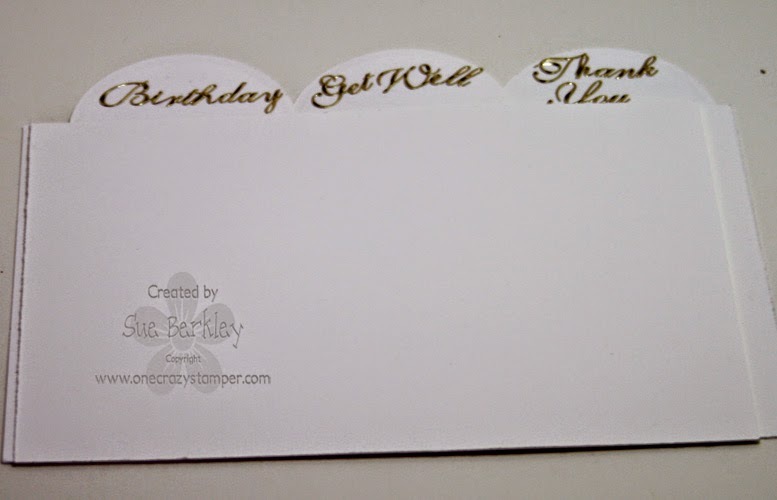 Cut one piece of the white cardstock in half so that there are 2 pieces of 6" x 12". Using one of the 6" x 12" pieces of cardstock, score at the following at the following measurements of 2", 4 1/8", 9 1/8" and 11 1/8". If using the Scor-Pal, score at the 2" mark and fold. Slide the fold over to the endge and score at the 2 1/8" mark and fold. Slide this fold over to the edge and score at both the 5" and 7" marks. 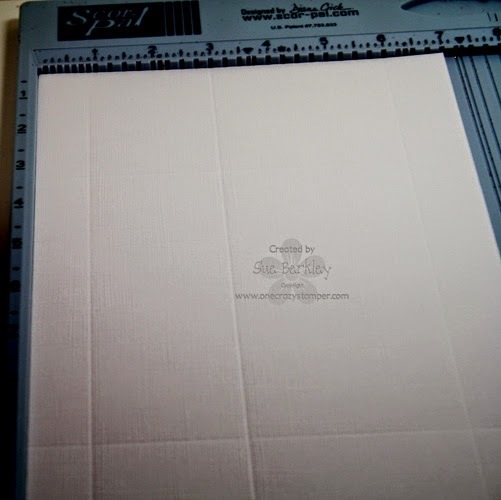 Once all the folds have been done at the score marks, this sheet of cardstock will form the outer covering of the organizer. Cut the second sheet of cardstock at 7" x 12. Score the 12" side at 1", 3", 9" and 11". Turn the cardstock to the 7" side and score at the 1", 3" and 6" marks. Turn the second sheet of carstock so that the 12" side is at the top. 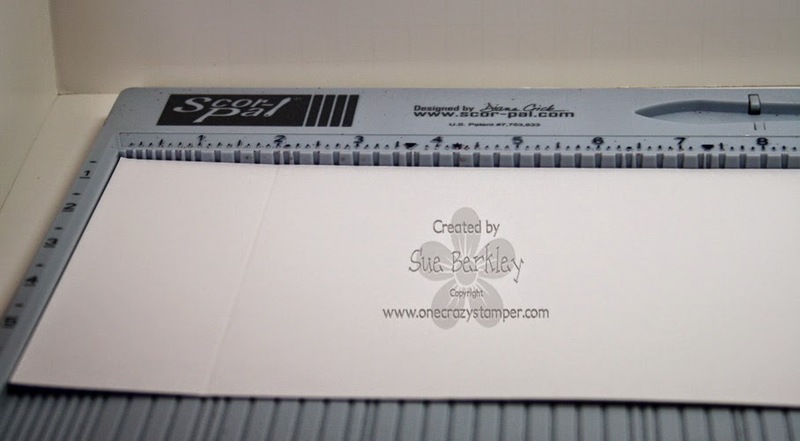 There are 3 small sections, in each of the bottom corners that need to be trimmed away: - a 1" square in the corner with two 1" x 2" rectangles as show. Fold the 1" flap along the top down and just tack it down. Fold the 2" square flaps down and apply adhesive to each. Stand the 12" piece up and adhere the 2" square flaps to the 2" x 3" sides. The inner container is beginning to take shape -- apply adhesive to the 1" flaps. The container slides into the outer shell of the organizer as shown. 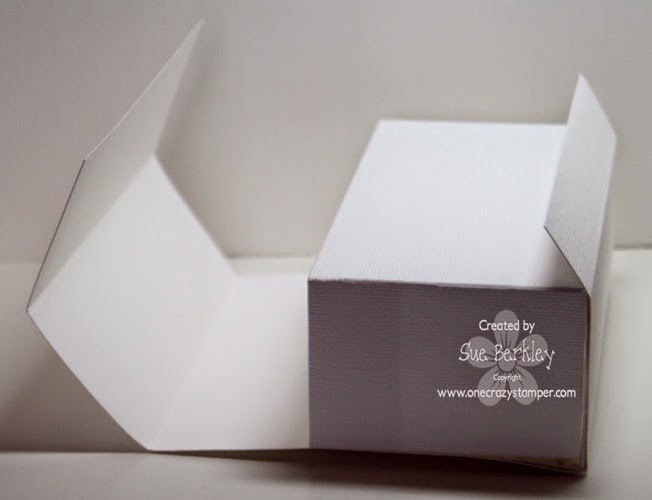 Add adhesive to the bottom and 1" flaps to the organizer. Cut a 4" x 6" piece from the original piece of cardstock that was set aside and adhere it to the 1" flap of the organizer shell. 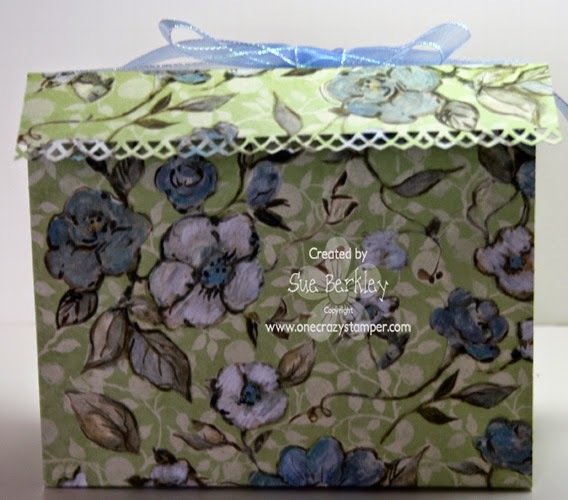 A pocket can be added in the decorating stage to hold postage stamps. I added the designer paper at this point, but I really wonder if it might have been easier to do that before everything was adhered together. I attached a Hook and Loop Fastener Tab (Tombow) to the front panel and inside the lid flap. I hope you found this useful. Until next time, keep crafting and remember to stay tuned for Sunday, when OCS will have a brand new challenge. Hey Hey crafty peeps! Terrific Tuesday is here!! 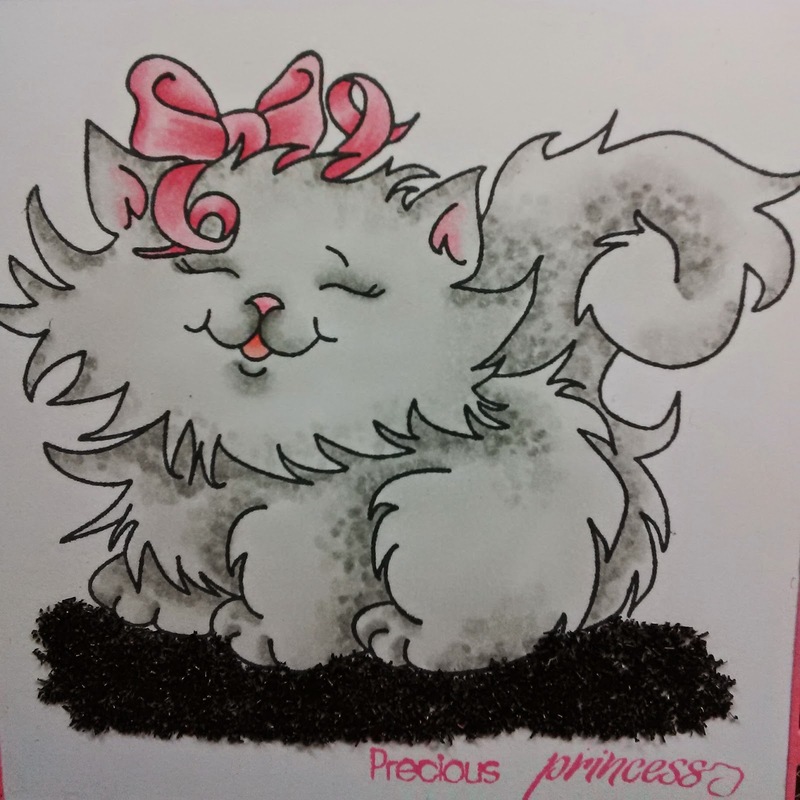 I stamped my image with versamark, embossed it, and then coloured with tombow markers. 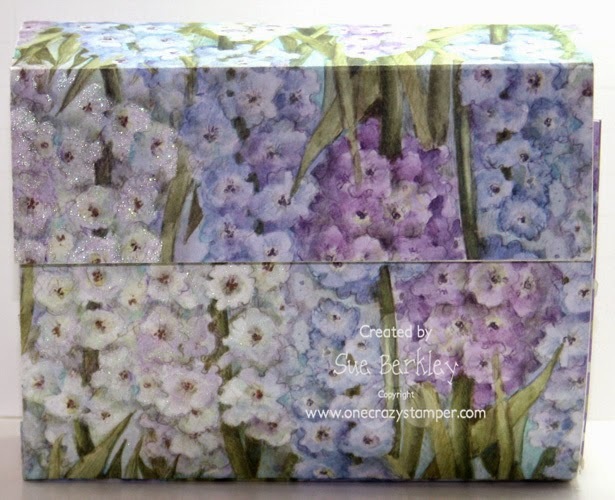 I added a lovely decorative border die, some embellies and beautiful flowers. I decided to venture outside to bravely photograph my card in the snow yesterday, it was freezing but worth it for the natural light. Now its your turn to create something and join in on the OCS fun, you can enter our challenge right here! Tombow Markers- 491, 528. 985, 993. 177, 195. 969, 977. 772. My little berry friend, sure does make me laugh, and I hope you like him as well. 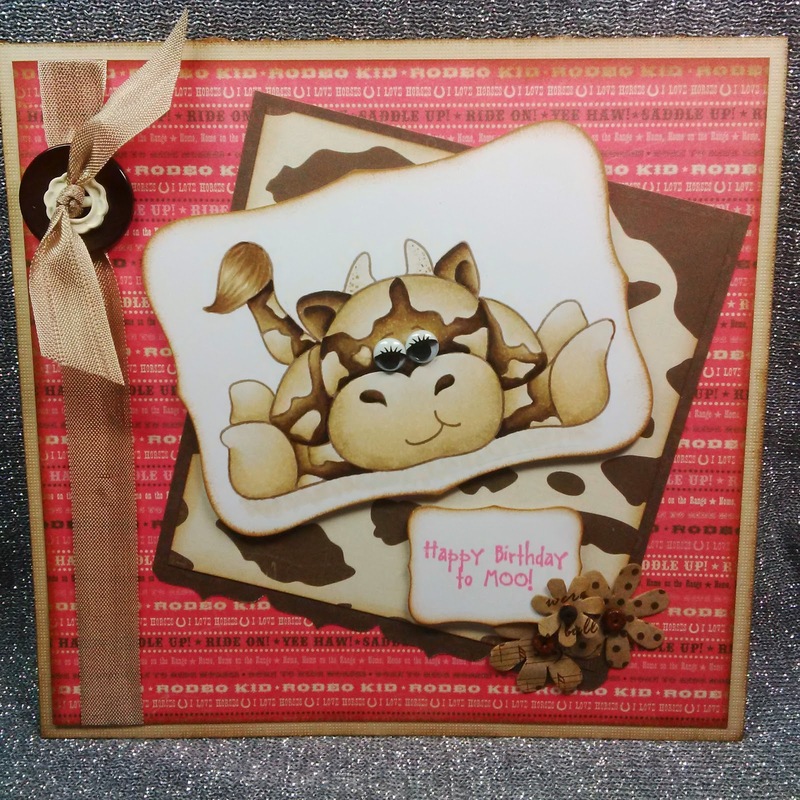 My card is for our challenge here at One Crazy Stamper. February challenge is Red, White and Diecut. Please play along with the design team, and Lora has wonderful prizes as well as a wonderful array of supplies in her store. Thanks again for stopping and please play along with our challenge, till next time happy crafting. 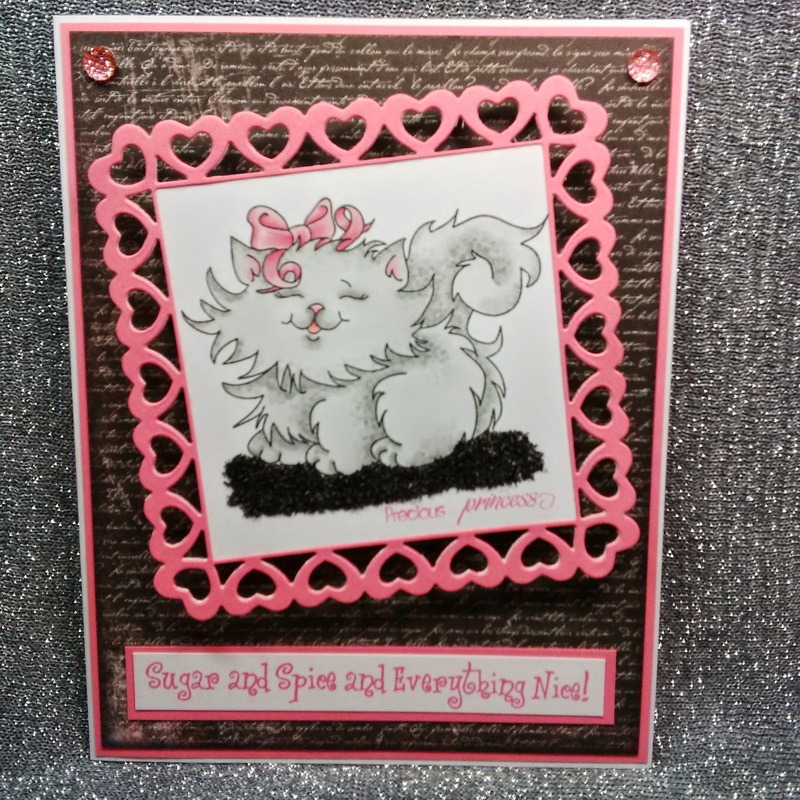 Supplies: Cardstock-red, white, xpressit copic, flowers, spellbinders, stamps-HH berry nice, 3D foam, Simple Stories-Pattern Paper, Copic Markers-E35, E31, E37, E95, Y28, R29, YG95, YG99, Wink of Stella. I hope that you enjoyed today's card. You still have time to enter into this month challenge, we'd love to see your creations!!! Until Next Time, Keep Crafting!!! This is Beary Wishes that I have colored with Copics - the bear received the terry towel technique to add texture to the fur. I colored the card front with a blue Copic marker to resemble clouds, then cut out two clouds that have the sentiment hand written on them. I hope you all had a good Family Day and enjoyed the time with your family. The weather is finally warming up for a change after the cold weekend. 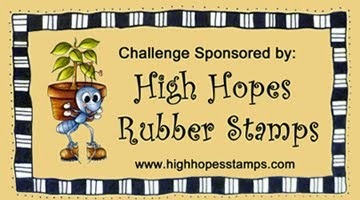 Here at OCS, we are having a "Red, White and a Die" challenge and the design team are using the January release of High Hopes Rubber Stamps. 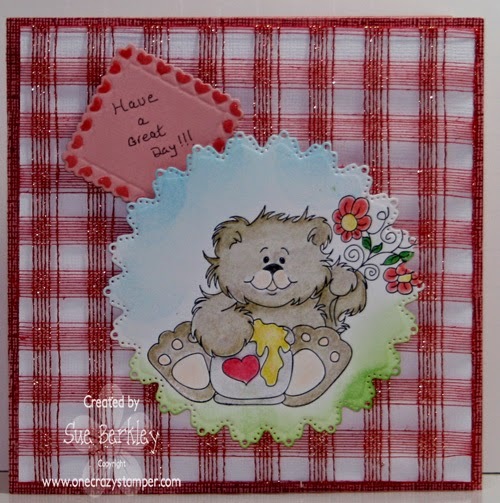 For my post today, I have used the adorable Favourite Honey Bear. I coloured the image with the Spectrum Noir Pencils, added Ranger Distress Ink to the image. I hand wrote the sentiment as I didn't have a suitable sentiment. The hearts were coloured with a red Stella of Wink, and the clear was used for the honey and flower centers. The mesh was from my stash. There is still plenty of time to enter this month's challenge for a chance to win a prize pack from OCS. If you are in need of some retail therapy, check out Lora's brick and mortar and online OCS stores for some amazing products and prices. Until next time, keep crafting up a storm and enjoy yourself. 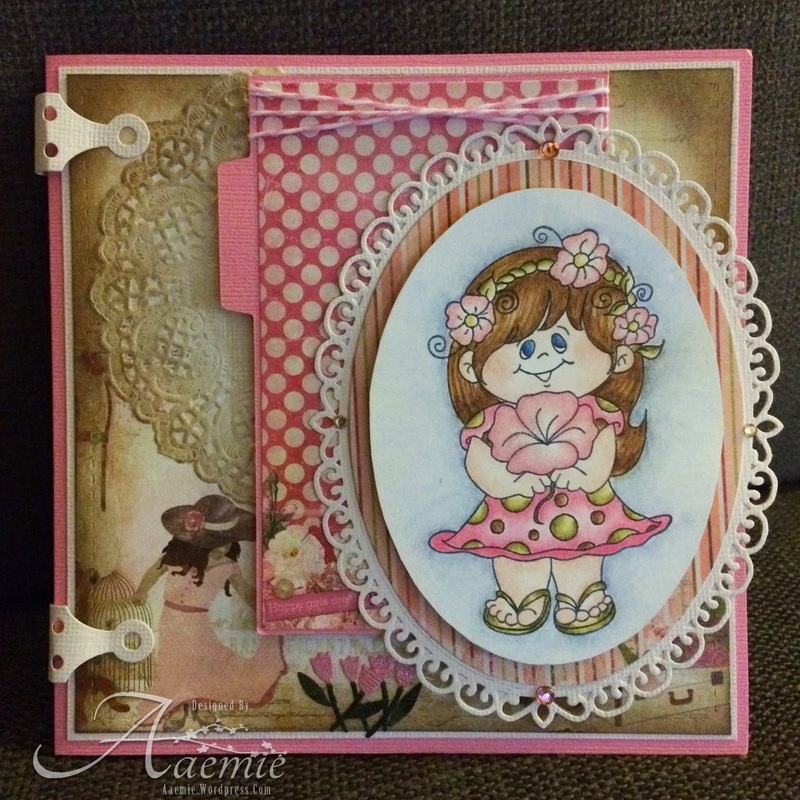 Check out this little miss cutie pie I have for you all today, I coloured her with prismacolor pencils and paired her with the perfect little Miss Collection from Bo Bunny. I also got to use a few of my new dies including these super cool hardware hinges that I picked up at OCS this weekend. Have a awesome and crafty day! Pirismacolor Pencils- Hair-GOLDEN ROD & CHOCOLATE. Dress & flowers- PINK, BLUSH PINK, YELLOW OCHRE, ARTICHOKE & MOSS GREEN. Skin - LIGHT PEACH, PEACH & NECTAR. Background- POWDER BLUE & SLATE BLUE. Eyes- PERIWINKLE & INDIGO BLUE. 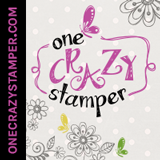 Thanks for checking on me, and what I am creating for our February Challenge here at One Crazy Stamper. Red White and Diecut. I do hope you can enter your creations and be inspired by the talented design team as I have been. Also stop by Lora's store and restock your supplies. Till next time Happy Crafting! Card Stock-Red, White, Black. Xpressit Copic Cardstock, Flowers, HH Stamp-Ladybug Love, Ribbon, Pearls, Dies, Wire, Foam, Wink of Stella, Copic Markers-E000, E00, YR27, YR24, YR23, G99, C10, R27. I know what you are thinking, hey she used this image already- well yes I did and I just wanted to show you that not every cow has to be black & white. 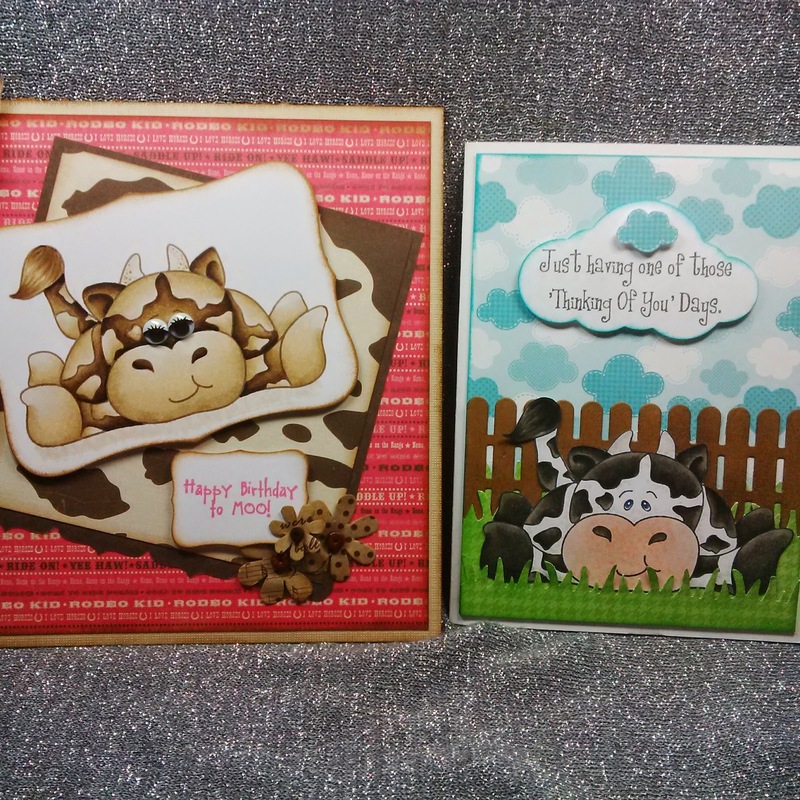 At the end of the post I will show you my two "Takin' A Break" cards side by side so that you can see that this image is so easily used with different colours and that they look completely different. I hope that you enjoyed today's post and I would love to hear from you. 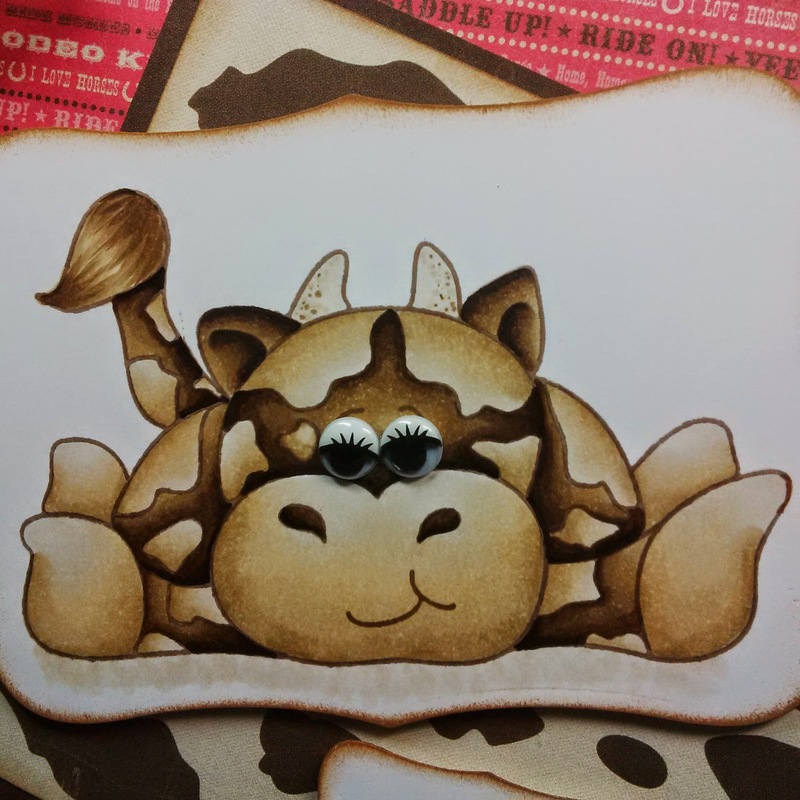 Don't forget to pop over to www.onecrazystamper.com to purchase your Takin' A Break stamp! 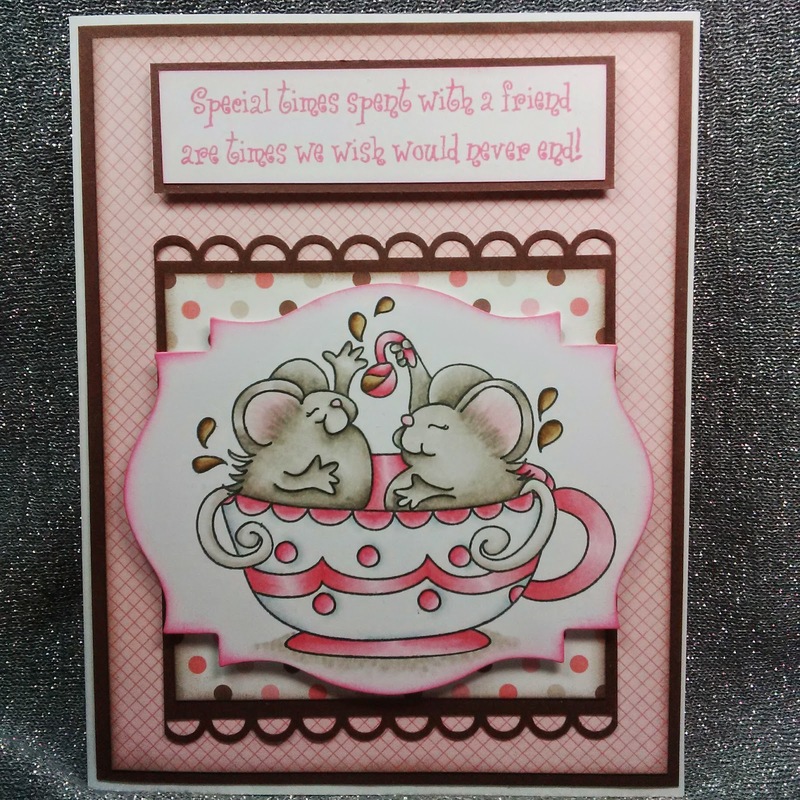 Labels: Distress Inks, High Hopes Rubber Stamps, Shari G.